People have become too used to emails hitting their inbox. And because they are easy to miss or delete, they may not always be the best option for your message. An internal memo might be a better choice, especially if what you need to say is important. Writing a memo rather than an email may seem daunting, but it isn’t – especially when you use our free memo templates that break it down into step-by-step pieces. When Should You Use a Memo? A memo, or memorandum, is a brief written report from one person or department to another. It’s often a form of mass communication rather than a one-on-one. An interoffice memo may communicate an organizational directive or change in policy or procedure, or combat the company grapevine with its rumors and hearsay. Email is rampant in the business world. It’s not unusual to get dozens or even hundreds of emails every day. Which makes sense, given the purpose they serve; if you are writing a quick communication that you know will be deleted, email is a great option. However, when what you need to say is more important than an email warrants, send an interoffice memo to your staff instead. And if you are writing to someone outside of your organization, a business letter is an even better option. Memos should not be confused with a private placement memorandum, which is a legal document supplied to investors when selling stock securities in a business, or a credit memo, which is a credit note given to a buyer. You can use a number of different types of memos in your business. Memos should be a concise communication with a clear purpose to a person or group of people. It typically has a specific format—but don’t worry, our free memo templates have done all of that for you, so that you don’t miss anything important. The heading is arguably the most important part of your memo. Without a good lead, readers may decide it’s not worth their time to read your communication. The heading typically lets readers know the date, subject, and recipient of the memo. To: This is the recipient(s) of the internal memo. Use only the first name if it’s an informal communication, and the first and last name and department if it’s more formal. If the memo is meant for an entire department, address it to that specific department . From: Memos are usually from a specific person. Use the same level of formality that you used on the recipient line. The first section is the purpose of the memo. It gives readers the context for the communication and contains a brief highlight on the reason for the memo. In the introduction to your internal memo, let readers know the situation or event you are addressing. The main body of the memo is going to be the message, including background information and the resolution. This section may include statistics, examples, or reasons so that readers understand how the decision was reached. The final paragraph will be clear on what action is being taken so that all readers understand. It may include a directive, call to action, or what other actions can be taken. Proofread your document – Since it’s a professional business document, ensure that it doesn’t contain any typos or spelling errors. Check your terminology – Does the document contain words, abbreviations, or acronyms that everyone will understand? Use the definition or a different word if it’s going to cause confusion with readers. Use white space – Make sure paragraphs aren’t so long that you lose readers. Break long paragraphs into shorter ones and consider adding bullet points or sub-headings. Get rid of emotion – A memo should be factual rather than emotional. Replace emotionally charged words with objective ones in order to retain your professional demeanor. Logical – The memo should be logical and easy to understand. Does it flow in a methodical manner or is the information all over the place? Don’t make assumptions about what background information readers bring. Length – A memo should not be very long. If it’s much more than a page, you should either write more succinctly or switch formats. Is a memo appropriate – If you are divulging something sensitive, a memo may not be the best form of communication. For example, if you are firing someone, you should probably tell them in person that they need to update their resume. The free memo templates below are all formatted and ready to use. Simply download the theme you want, add the appropriate text, and you are ready to send out this simple communication. Use this document as a brief record written as an aid to the memory: memorandum, notation, note. This template is free and can be easily modified to meet your needs. Simple memo design with blue gradient boxes in the header and footer. Formal design with red-and-black pattern sidebar. Simple blue theme with big heading Memo and a sidebar for additional information or company details. Basic internal memo template in black and white. Simple elegant theme; change template colours to be inline with your corporate style. Blue gradient theme with heading info inside of a simple table with gradient background. Elegant formal design for an office memo template with company address, heading, and content sections divided by black lines. Very elegant and simple formal interoffice memo template with date, heading, and content section. Theme with brown side bar to include additional info. Use it to remind employees about latest business news, or to provide additional information about topic of the memo. Simple employee memo template design suitable for any business. Simple business memo template format with document title placed into the sidebar. Formal and simple corporate memo template with many formatting styles that also can be used as corporate letter template. This free “Memo template word 2010″ is for Microsoft Office Word 2010 and can be used as a memorandum for business. This template has space for company name, memo subject or memo title, company info / details (address, web site, or other information), and a field for date and signature. Simple letter sample design for confidential information. Very basic memo word template with heading and current year in the header, and memo content below (to, from, subject, date, and the message itself). Use this document as a memorandum, notation, or a note on confidential information distributed within your organization. Simple and elegant business letter format that can be used by any company. Just add your logo, change fonts and colors. This template works with styles for fast and easy editing. Very simple and elegant office memorandum example with border lines to separate heading from content section. Simple theme with blue page border, date, and heading. Content components include to, from, subject, and memo message section. Creative design with green waves in both header and footer fo the document. Elegant floral theme. Use this template for an announcement, or a flyer for wedding, flower shop, or any other business. Elegant, creative and artistic, yet very corporate format sample. Technology theme with abstract blue lines in the footer; styles are used to make template editing easy. Memo template to announce events, issue reminders, or any other time-related news. Informal artistic memo with funny image creating the title of the document. Simple one-page memo template with an image of a post-it and the word “memo” in the header. Simple theme with green gradient on the left side. Creative business memo with modern image of blue waves in the bottom part of the document. Artistic business memo with large image of waves in the header. Perfect design for single-page business document. Simple memo design with an image of blue stripes in the background. Replace image and colors to fit your business needs. Corporate technology theme with subtle blue background, waves and globe. Technology memo theme with binary numbers image on the left side. Formal professional and neutral memo theme for nternal communication in business and academia. Great theme for IT and computer-related news. Simple design with an image of a computer mouse in the footer. Memo template with an image of a paper and a paper clip in the footer of the template. Use this template for short memorandum, announcement, notice. Simple memo design with an image of a world map in the background. Attractive theme with green background and angular design elements in the bottom of the template. 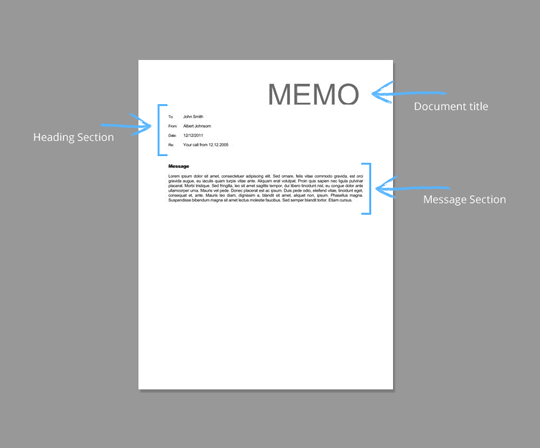 Memo template with an image of a paper clip on the left side. Orange header background repeated on each memo page. Red and black theme with black borders to separate memo sections. One-page memo template with an image of a notebook in the background and repeated word “memo” in the header. One-page simple memo, DNA theme. Simple memo template with blue mountain scheme and blue footer gradient. Winter Holiday memo with bright yellow background and snowflakes.